This year has been a wonderful one, not just in life but also for my blog! It has grown, and I feel I've really improved as a blogger in developing good content and getting strategic and consistent about things. Apparently you guys are happy with it too, because many of you have stuck around and more of you have come along for the ride! 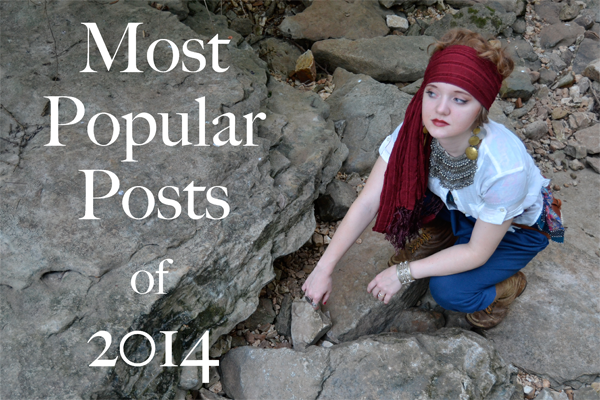 Here are the top 10 most popular posts of 2014, as decided by you guys and your views! 9. Is Your Wardrobe Architectural, Printy, Tactile, or Utilitarian? It's kind of surprising, isn't it? Then, personally, here were my top five favorite posts of 2014. I either really enjoyed doing them, had a great response, or liked the conversation the post elicited! 2. Controversial Post: Vintage Prints and Jewelry--Racist? Now's your chance to share your thoughts! I'll be pondering posts for next year and getting my strategy going, so now is a great time to give input! What are one or two of your favorite posts, or types of posts? What would you like to see more of? Any other questions, comments, or concerns? I love when you bring up controversial subjects regarding vintage fashion and other related topics, and not only express your ideas on the subject, but also open it up to other peoples' opinions. I also really enjoy your sewing posts! You do such a great job at them, and your vintage fashion posts are very fun too! Way to go, dear gal! Your blog is been full of interesting, dynamic, fantastic content all year long and I really enjoyed seeing what you were going to share here with us next. Two of my faves of yours this year were your fashion tips for petite ladies and your look at vintage sweetheart bracelets (though I may be a touch biased there :D). Congratulations on your eventful year! I enjoyed the petite ladies post, and I always enjoy your posts about sewing, even though I simply can't sew myself. As for future posts, perhaps something on perfumes that were popular in various eras? I enjoy your sewing projects, because they are always elegant and often unusual, and I love your controversial posts because they make me think and I get a lot from reading the comments too. Not to say I don't like the other posts, but these stand out for me. A Christmas E-Card for You! December Sponsorship Special - 10% off coupon! Mrs. Depew Pattern Giveaway Winner!